The last time I ran was on Thursday! What can I say, life (and weather) got in my way. But let's rewind to that Thursday run - Cary and I met for our usual 6:00 am run. It was 75 degrees - who knew that would be the high for the day? Yep, a front came in and cooled our area down less than an hour after we finished our run...go figure. Oh well, it was a good run and our pace was great, even with the warm weather. And if I recall correctly, we not only ran up both of the tougher hilly parts, but we managed to chat the entire time, as well! I call that a victory, because a major part of running with friends is the side-by-side therapy that goes along with the run, and making that happen during the hills is good! We were out of town for the long weekend, and didn't even pack our running gear, partly because we knew we'd be pretty busy, but also because the weather was supposed to be stormy. Which it was. If you've seen the news, you're probably aware of the terrible flooding that a good part of Texas has experienced. We planned on driving home from north Texas later Monday afternoon, but a really bad storm was predicted to come in, so we headed out early. Turns out, not quite early enough...we were about 45 minutes from home when an emergency alert came over the radio, saying there was a tornado warning west of us, and headed our direction! Yikes...we were out in the middle of nowhere, so we just kept driving and hoped for the best (although Jeff had plans involving the low-lying bar ditch if we saw a funnel cloud)(which to me seemed like we might survive the tornado but then the flood would get us)(luckily we didn't have to make that decision). Talk about driving into the eye of the storm! Wipers were going full speed, while we'd slowed down to a crawl, with our hazard lights on. Believe it or not, there were cars just ahead of us, but we couldn't even see their tail lights most of the time. We got to Hearne, where the power was out for the entire town. It was starting to flood a bit - you can see the car ahead of us was going through some deep puddles. Not sure why they didn't move over one lane, like we did - it wasn't as bad there. And then, about a minute after we got through Hearne, the rain (mostly) stopped - we were ahead of the storm. We made it home just before the storm hit our town, whew! I don't think I've ever seen our backyard this flooded in the 15 years we've lived here. Front yard fared a little better, except for the river on the side coming from the backyard. And the grassy area in the center of our cul-de-sac? Filled to the top with water! It IS for drainage, so it worked properly, but it was weird to see it get that full in a very short timeframe. Believe it or not, after all that rain, we got up yesterday morning to run. It wasn't raining, but when we got outside, there was lightening and thunder in the distance, and quite honestly, I wasn't exactly feeling great about coming across some displaced giant snakes in the dark (this was at 5:00 am), so we ended up letting Paco come out and we walked in circles around the grassy area for about a mile before calling it. Points for trying, right? Wow. Glad you are safe and yes, points for trying! You know I heard about the storms in Texas but since it's such a huge state I thought you would be okay. You are in the end of course but you sure drove through a heavy storm and got your share of rain at home. I'm happy to hear you are safe. The storms have been hitting a huge part of Texas - nearly everyone has been affected. Rained again overnight, ugh. Wow, that is some scary weather ya'll have been having. We were suppose to get rain every day since Monday but we hadn't got a drop yet! I am enjoying this beautiful weather for now and a tad upset I can't be running in it! And your poor backyard!! Are there any gators living out there yet? Wow! Crazy pictures of the storm! How scary! So glad you made it home safely! Dodging this severe weather sure is getting old, ain't it? Glad you made it home safely! Weather is so scary sometimes. 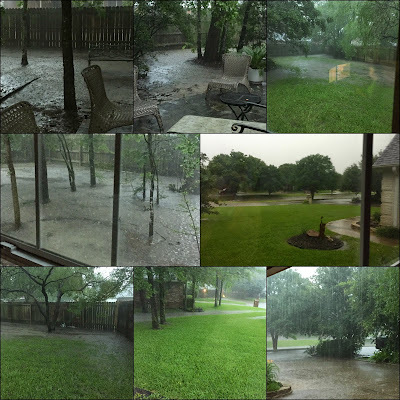 Shelley, my daughter-in-law sent me a video of the rain and her flooded back yard in Austin - it was so crazy! She texted me and said "do you think it would be rude of me to order a pizza when there is a tornado warning?!" You and I had a discussion once about basements and how there really aren't any in TX. Everyone should be thankful for that because I guarantee you they'd be flooded. Seems to me from what I've seen the flooding is bad enough. I hope this dumb weather moves along quickly and life gets a bit more routine. And I hope you had a good time away over the long weekend. Oh for sure - if we had a basement, it'd be flooded! Shelley! I've been thinking about you!!! The Texas rains have made the news up here in Vancouver, and I've been hoping you, Jeff and the furbabies are all ok!!! How's the work coming along on your ark?? Crazy weather for you poor Texans :-( And giant snakes in the dark sound like a perfect reason to take a rest day - hope things brighten up soon! Wow!! Scary! Glad you were safe. Congratulations on the run while still being able to talk with your friend at the same time. I am so impressed. It does make the exercise so much more fun when there is someone to talk with. Wall clouds give me the heebie jeebies, especially when I'm driving. I can't scan for the telltale drop-down and drive at the same time. So glad you made it home safely and that you didn't have severe flooding in your area.